The French Grand Slam Roland Garros takes place this month, but DID YOU KNOW — that Adidas’ Stan Smith trainer actually started life in 1964 as a ‘Robert Haillet’? The legendary tennis shoe was developed by Adidas in conjunction with the then French tennis champion and Davis Cup star of the same name and was first manufactured in Landersheim, in northern France. The Stan Smith is immediately recognisable by its simple design, its three rows of perforations — or ventilation holes — on the sides, and the distinctive green logo at the ankle. As the Robert Haillet it was the first tennis shoe to be made of leather and the brainchild of Horst Dassler, the founder of Adidas France. The Haillet-inspired shoe enjoyed an nine-year reign at Adidas, but, after the American player Stan Smith wore a pair en route to winning the 1971 US Open, his name was added to the shoe alongside that of Haillet. Both names remained on the shoe for about four more years, when the shoe was formally rebranded as the Stan Smith. The rebranding was an instant worldwide success and Stan Smiths are in great demand to this day. In 1994 the Guinness Book of World Records proclaimed that it was the world’s most-sold shoe, with more than 40 million pairs sold. Adidas has no accurate record of the total numbers sold, although some sources estimate that 70 million pairs have been on tennis courts or chic nightspots worldwide. 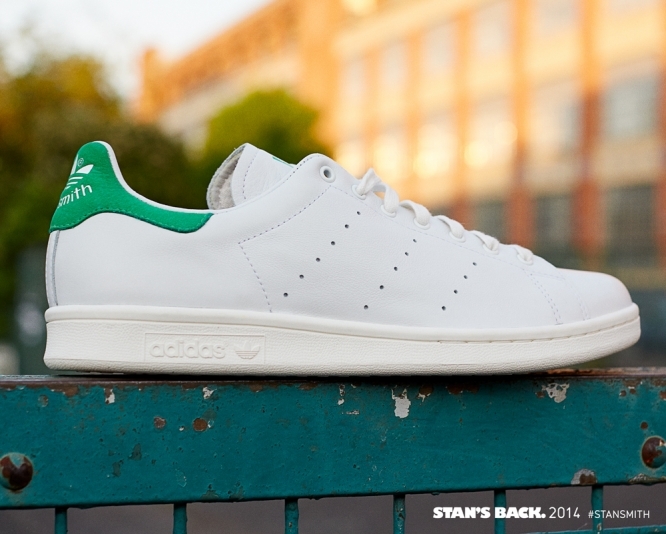 In 2011, Adidas stopped manufacturing the Stan Smith, causing a surge in demand for the vintage shoe. Manufacturing began again in 2014, and the trainer was relaunched with colourful designs by designers such as Jeremy Scott, Marc Jacob, Yohji Yamamoto and singer Pharrell Williams. The shoe is available in a number of modern variations: you can customise it; buy a pair in black suede or with red polka dots, and you can now even purchase a wedge-heeled version — called the Stan Smith UP.